Featured amenities include express check-out, a 24-hour front desk, and luggage storage. Planning an event in Laughlin? This hotel has facilities measuring 27000 square feet (2508 square meters), including a conference center. A shuttle from the airport to the hotel is complimentary (available 24 hours). 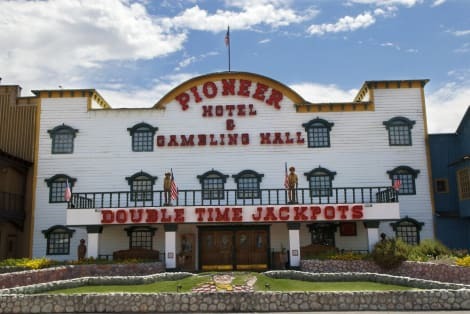 When you stay at The New Pioneer in Laughlin, you'll be on a river, within a 10-minute walk of Laughlin Event Center and Regency Casino. This casino hotel is 0.4 mi (0.7 km) from Laughlin Labyrinths and 0.5 mi (0.8 km) from Laughlin Outlet Centre. Grab a bite to eat at Hickory Pit Steakhouse, one of the hotel's many dining establishments, which include 6 restaurants and a coffee shop/café. Wrap up your day with a drink at the poolside bar. Buffet breakfasts are served on weekdays from 6:00 AM to noon and on weekends from 7:00 AM to noon for a fee. With a stay at Harrah's Laughlin Hotel & Casino in Laughlin, you'll be on a river, within a 10-minute drive of Laughlin Event Center and Laughlin Labyrinths. This beach resort is 1.5 mi (2.4 km) from Regency Casino and 1.5 mi (2.5 km) from Laughlin Outlet Centre. With a stay at Tropicana Laughlin, you'll be centrally located in Laughlin, within a 5-minute walk of Laughlin Event Center and Regency Casino. This casino resort is 0.3 mi (0.6 km) from E Center and 0.5 mi (0.9 km) from Laughlin Outlet Centre. Head straight for the casino, or wait for that lucky feeling while you enjoy one of the other recreational opportunities, such as a nightclub and an outdoor pool. Additional amenities at this resort include complimentary wireless Internet access, gift shops/newsstands, and tour/ticket assistance. Don Laughlin's Riverside Resort Hotel & Casino is in the heart of Laughlin, within a 10-minute walk of Don Laughlin's Classic Car Collection and Laughlin Event Center. This casino resort is 0.4 mi (0.6 km) from Laughlin Outlet Centre and 0.4 mi (0.7 km) from Regency Casino. Make yourself at home in one of the 720 air-conditioned guestrooms. Complimentary wireless Internet access keeps you connected, and cable programming is available for your entertainment. Bathrooms feature bathtubs or showers, complimentary toiletries, and hair dryers. Conveniences include desks and complimentary bottled water, as well as phones with free local calls. When you stay at The Aquarius Casino Resort, BW Premier Collection in Laughlin, you'll be in the entertainment district, within a 5-minute walk of Laughlin Event Center and Laughlin Outlet Centre. This casino resort is 0.1 mi (0.2 km) from Regency Casino and 0.3 mi (0.5 km) from Don Laughlin's Classic Car Collection. lastminute.com has a fantastic range of hotels in Laughlin, with everything from cheap hotels to luxurious five star accommodation available. We like to live up to our last minute name so remember you can book any one of our excellent Laughlin hotels up until midnight and stay the same night.